NEW ORLEANS – For the first time since 2009 and for the first time ever, respectively, the Adams State women and Colorado Mines men have been named the 2015 NCAA Division II Cross Country Scholar Teams of the Year by the U.S. Track & Field and Cross Country Coaches Association (USTFCCCA). The full lists of All-Academic Teams can be found below. 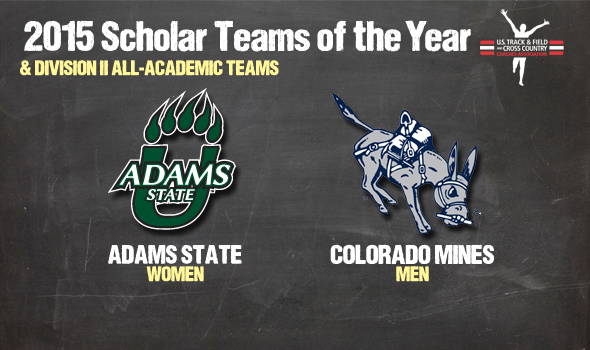 Prior to this season, Adams State’s national champion women had last won the NCAA team and earned Scholar Team of the Year awards in 2009. This year’s iteration of the Grizzlies posted a team GPA of 3.17 while derailing the three-time defending national champion Grand Valley State women. ASU toppled the Lakers in Joplin, Missouri, 83-97. Each of the five Adams State scorers garnered All-America honors, of whom four also earned All-Academic Individual plaudits. Noel Prandoni, Jenna Thurman and Maura O’Brien led the way in 10th, 11th and 14th. All told, five Grizzlies earned All-Academic Individual honors. Beyond the NCAA Championships, the Grizzles also won titles at the South Central Regional and the RMAC Championships, and finished seventh out of 26 teams in the Division I race at the Roy Griak Invitational. After finishing a program-best runners-up at the 2012 NCAA Championships, the Colorado Mines men finally broke through for their first national team title in program history in 2015. The Orediggers, who compiled a cumulative team GPA of 3.155, took down three-time defending national champion Adams State, 100-127. CSM got All-America performances from four runners, led by the trio of Marty Andrie in 18th, Nathanael Williams in 21st and Dan Mahoney in 22nd. Logan Winfield and Seth Topper earned All-Academic honors for the Orediggers. Prior to the NCAA Championships, Colorado Mines finished runner-up in both the South Central and the RMAC to Adams State, and finished as the top non-DI program at the Arkansas Chile Pepper Festival. The Scholar Teams of the Year were among 137 women’s teams and 104 men’s teams that earned All-Academic honors from the USTFCCCA. In total, 149 unique programs were recognized, including 93 schools that had both their women’s and men’s squads recognized. EDIT: The women from Maryville (Mo.) women and the Gannon University men earned 3.799 and 3.8 GPAs to top their respective genders’ lists. Up next among women’s teams were Union (Tenn.) at 3.795 and Pittsburg State at 3.7823. Maryville (Mo.) also reported the second-highest men’s GPA at 3.679, followed again by Union at 3.667 and Lindenwood at 3.59. The full list of All-Academic Teams can be found below.